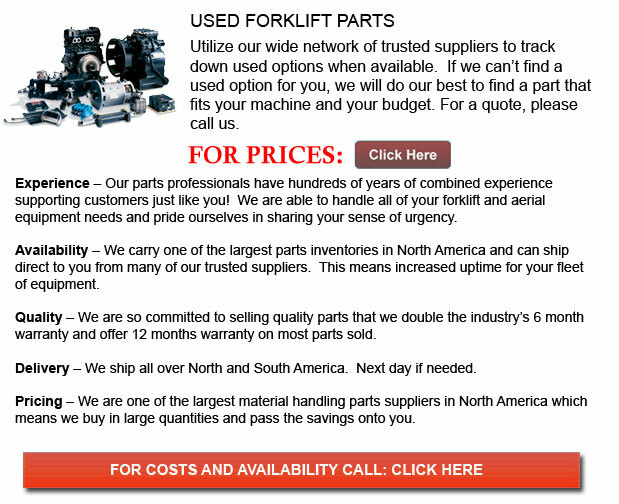 Used Forklift Parts - Sooner or later, forklift components would wear and need to be replaced. Purchasing brand new components can become a costly endeavor so another idea is to obtain used lift truck parts. This could save much cash eventually. It is a good idea to obtain used lift truck components that have been remanufactured. These parts would ensure that you are getting parts that will work for a long time and be productive. Worn or broken parts which are remanufactured are a less expensive solution compared to rebuilding. With rebuilding parts, just the parts which are broken or worn out get replaced, which means that other wearable parts might break down soon after purchase. Remanufactured parts are cleaned after being taken apart and have the unusable parts changed. This method could offer the best assurance for second-hand parts. All wearable parts are replaced regardless of age or wear which is another reason why reproduced parts generally work so much better. Any part within the part is brand new and this offers much longer life to the second-hand part. Based on the forklift components which are being redone, the cleaning process and the complete remanufacturing process would vary. After complete disassembly, the engines are oven cleaned. Different parts of the engine like spark plugs, pistons, rings, valves, valve springs, and filters could be replaced during the remanufacture process. The engines are hot tested after reassembly to ensure that there are no noise, no oil pressure problems, no leaks or any vacuum. Transmissions are one more item which is oven cleaned after being disassembled. The transmission is then washed. A complete examination is done to be able to check for any cracks. Seals, bearings and bushings are all replaced. Usually, the replacement parts used on transmission components meet OEM specifications. Certain forklift components like the water pump, torque converters, the alternator, steer axles and the starter can be quite serviceable after worn parts are replaced. The electronic control in the electric lift truck is maintained by the control card. This card can likewise be reproduced with replacing all aged and worn out components. Not like various forklift parts the control card could only have the worn and aged components replaced. Remanufactured components are meticulously examined upon reassembly to ensure they are in top condition prior to being sold. It is vital when obtaining reproduced components to be sure they have undergone the proper testing and inspection procedures. On certain larger parts such as transmissions, steer axles and engines, OEM specification replacement parts should be utilized. The dealer of used forklifts and components can guarantee that the reproduced parts have met OEM specifications and that these components meet industry standards. Lots of details go into remanufacturing second-hand parts. This attention to detail offers more serviceability out of reproduced parts compared to the components that were merely rebuilt.